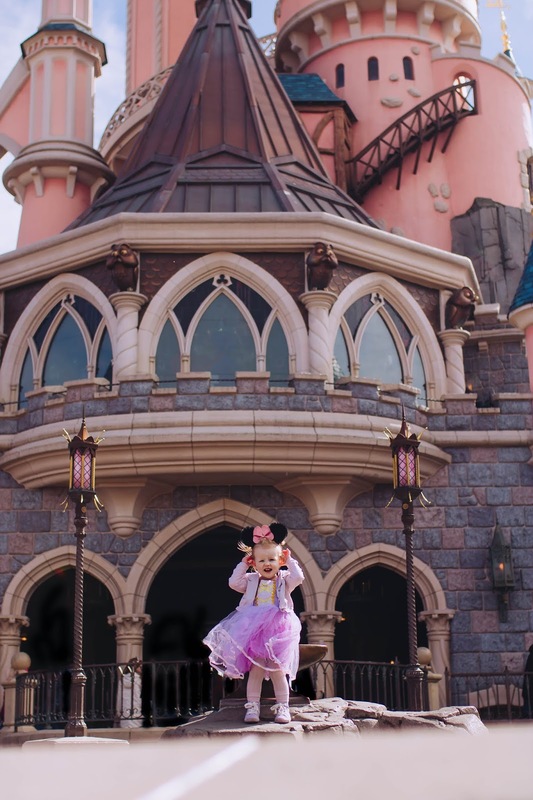 There are soooo many spots in the Disneyland Park for photos but I will hold my hands up and say i've not found them all yet. 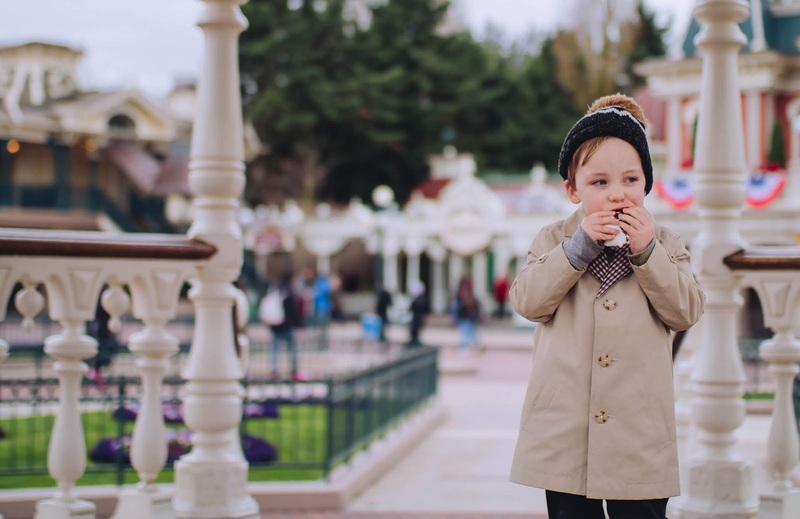 I get sucked into the magic a lot more whilst in the Disneyland Park and i tend to just be too in the moment that I forget the snap! That being said I will say I have discovered some of the best angles for the castle shots! The only angle I didn't get was sat on the draw bridge into the castle where you can sit on a little cut out bench type thing and it makes for a cute angle but i'll save that for our next trip! 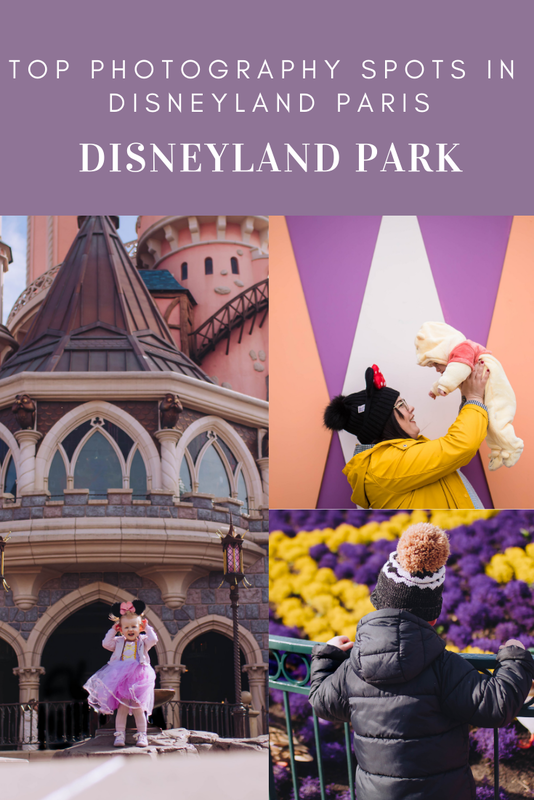 The Disneyland Park is utterly beautiful and magic and I thought i'd share some of my favourite photography spots! Once again i've used some photos from previous trips... I apologise for the inconsistency with the photo quality, it has made me realise how much my photography has improved since August 2015 to now! Lets start here because lets be honest, it's the one that EVERYONE who visit any Disney park takes! I have one in front of Cinderella's castle from my Disney world trip in 2010 (With an Ex boyfriend though sadly) and one day will compare from all the different Disney parks around the world. 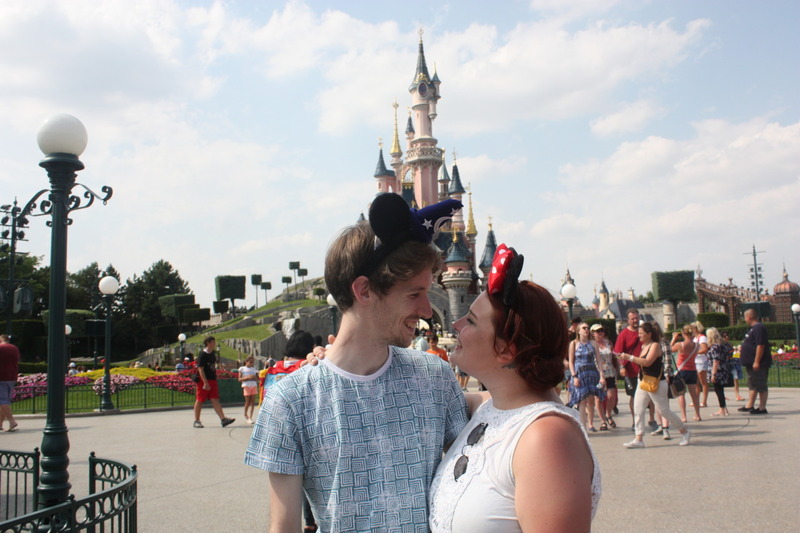 I don't know about you but Brad and I's Disney bucket list is pretty cool. 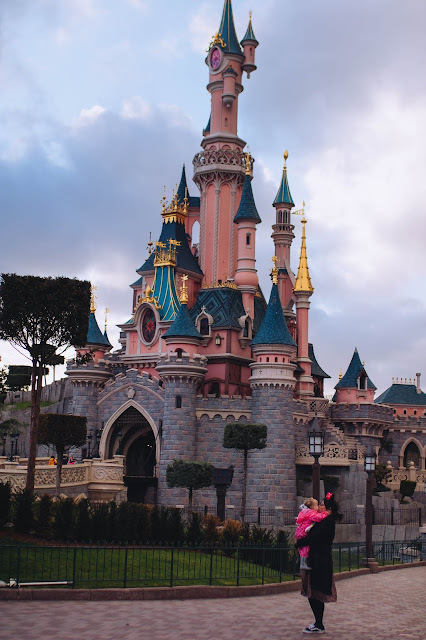 Anyway, angles of these photos, firstly try to get your castle shot in your magic hour if you're staying at a disney hotel but if not, it is still mostly possible to get your shot with limited crowds. So, last time I took a photo of Iris sat on what was an empty Excalibur post and sat her on there and took a photo from as low as I could get! It was quieter this time as the sword was missing so people weren't as bothered by this area! This time the sword was back and I was quite rushed due to the crowds of people watching me, waiting for me to move but during magic hours this would be quieter and you're less likely to feel under pressure! The little performance podiums that you may have seen cute little statues on if you've been during Christmas or Halloween or even dancers on during festivals like Princesses and Pirates. There are two very different style shots you can get from here, once again go low! 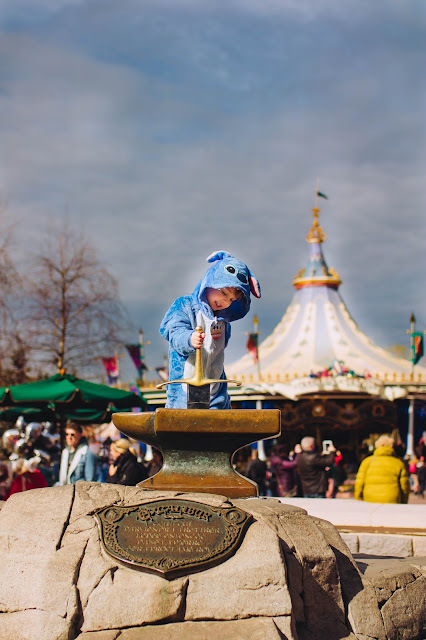 That's officially my photography tip for Disneyland Paris, photo wise GO LOW! So, the first one of Lucas and I, when we went at Christmas, is to get the castle in the background and stand in front of the fence. 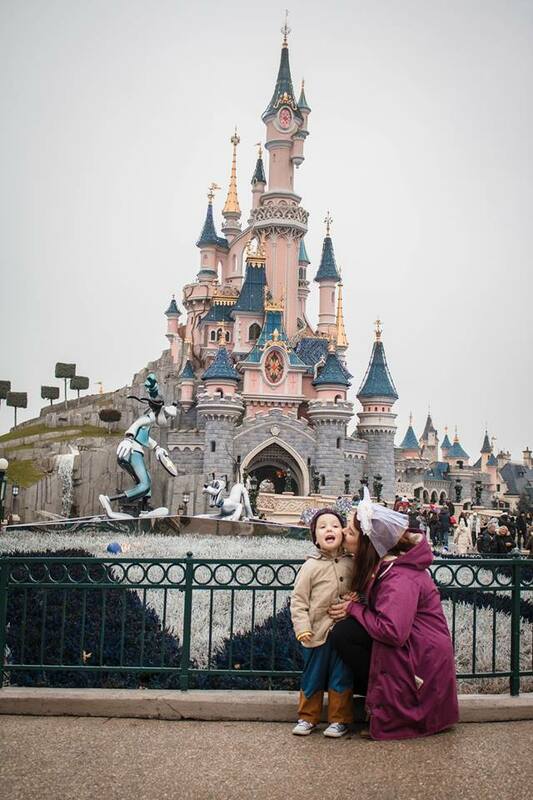 We have the Christmas Goofy and Pluto statue in the background too and the castle of course! This doesn't limit your crowds too much unless once again, taken in magic hours! 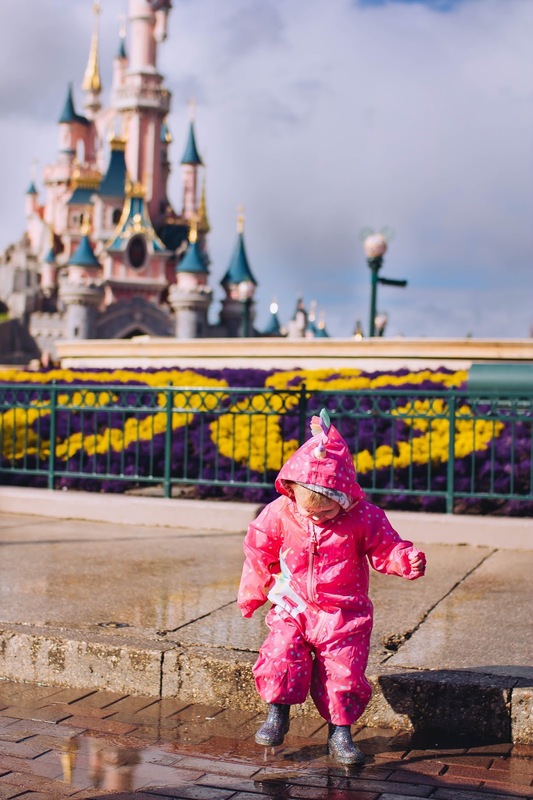 The second is one of my favourite shots, although we managed to avoid most rain pour when we went, there were puddles and we'd been smark and packed waterproofs and wellies for both Lucas and Iris so puddle jumping in Disney was allowed. Once again I "got low" to get a cute photo of Iris and the nice purple and yellow flowers in the planters and realised I could get the castle in the background too and I just love it! It's Iris all over. You can even slightly see the reflection of the castle in the puddle. Had the puddle been bigger it would have caught more of that reflection. So another tip would be to get creative, you never know what you might capture. We shot this just as they were closing the castle around 6pm (March time) to prep for Illuminations, so all you can see in the background is a couple of Disney cast members! The sun was starting to set and although sadly my husband isn't a photographer, he does usually capture pretty good photos with me setting up the camera and kind of directing him to angles. On this occasion if you zoom in you can see Iris and I are blurry BUT I love the photo nonetheless so i've decided to save it. If you head towards the Dragon under the castle you will find what I call "The view point" a circle area where you can get the closest to the castle and still be able to look up and see it! If that makes sense. 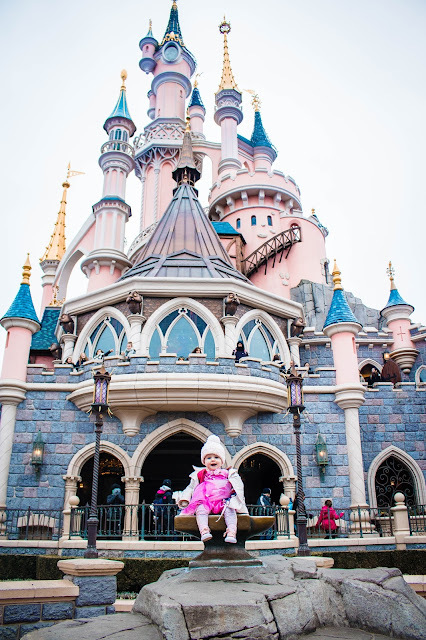 This can get busy but most of the time is quiet and once again if you "get low" or stand back you can get the cutest photo with the castle looking lovely in the background! 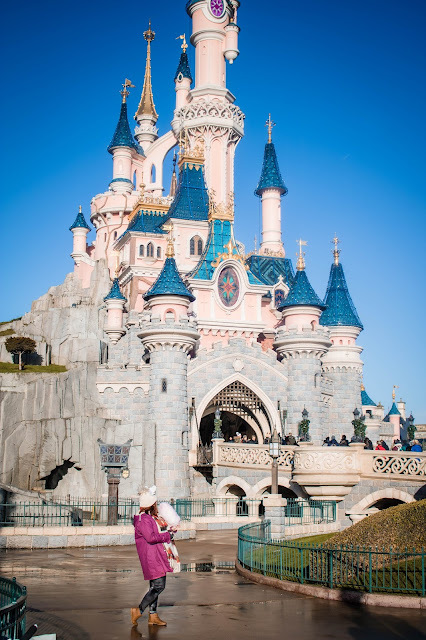 This is the most common angle for people, as they walk down main street you're constantly bumping into people emergency stopping with no warning for their "castle shot" and in my opinion its not the best shot! My favourite is from behind or from the left side! Either way, if you love the front of the castle shot then MAGIC HOUR! Especially if you go during Summer when this was taken and it's utterly manic with crowds. 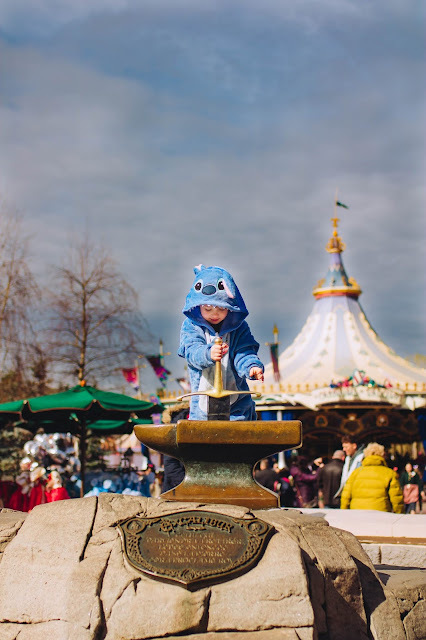 You know, the sword in the stone? Well for both our previous trips there was no Excalibur but this time, it was back! So Lucas had a go! HE LOVED IT!! you also depending on your angle get cute pink buildings and the carrousel in the background! The sky had gone a really weird colour this day, blue skies with grey clouds but its made a great colour for the photos! Outside City hall and the first thing you see as you walk into Main Street USA! It's so nice and makes the nicest colouring for photos. 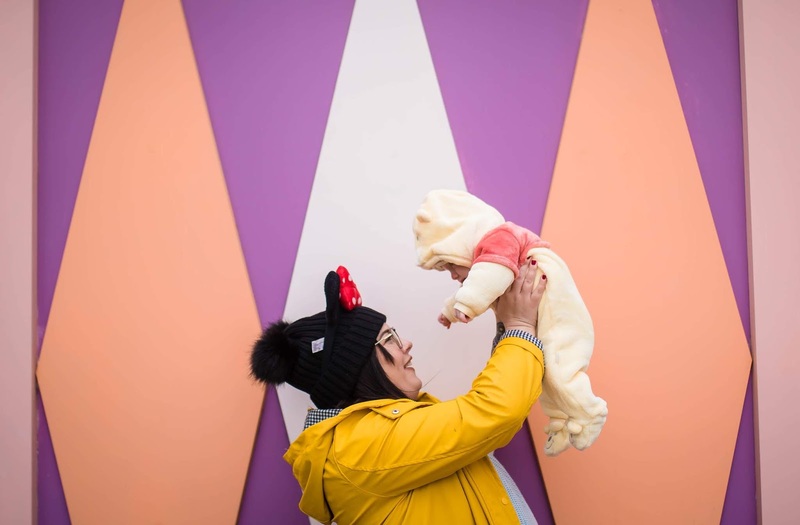 Iris was super grumpy by this point as I took these photos as we were leaving on the Friday but Lucas had a great outfit on for this and he compliments the bandstand perfectly. Main Street USA in itself it's a beautiful, colourful, photogenic street and I wish I could live on it. 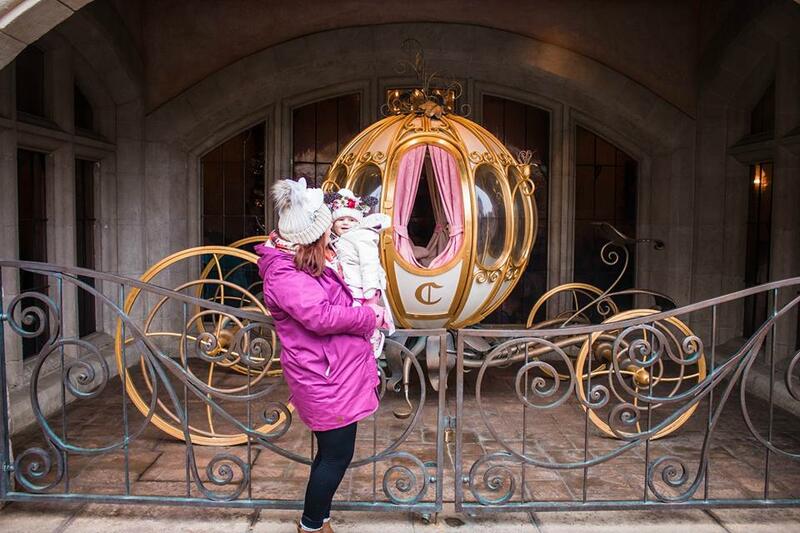 Outside Auberge De Cendrillion in the courtyard, you'll find this beautiful carriage which is the perfect spot for your little Prince or Princess to pose in front of, or yourself, aint no one judging you in Disneyland; trust me. 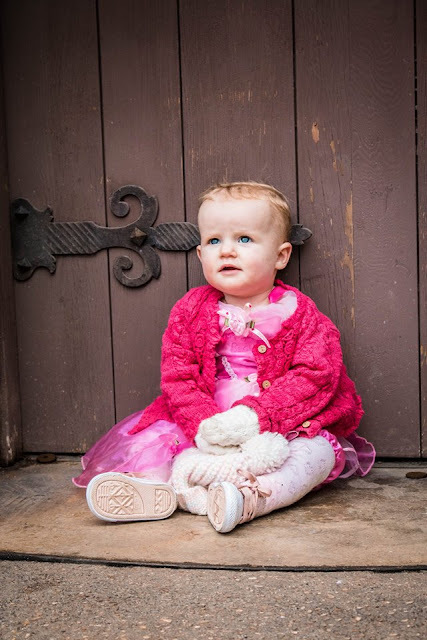 Look for doorways, there's a LOT in Fantasyland, these make great un-busy backdrops for outfit shots if you're littles have cute outfits, you have a cute outfit and especially if you're Disney bounding! If you head towards It's a small world, there's a spot, I call the parade gates as it's where the parade floats come in and out! 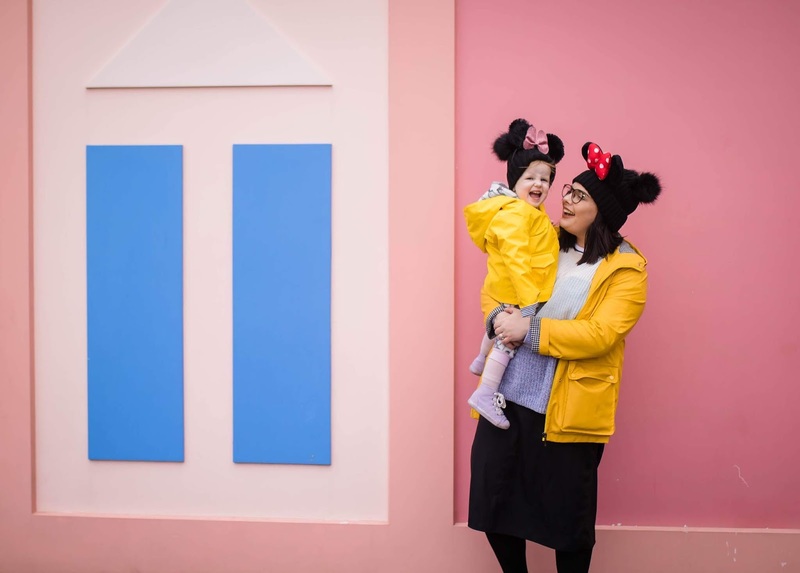 The ones in Fantasy land by it's a small world are such beautiful pastel coloured gates they make the perfect backdrops for a photo! I love them and my favourite photo ever of Roo and I (minus the birth ones as they stay offline for my dignity) was taken here! 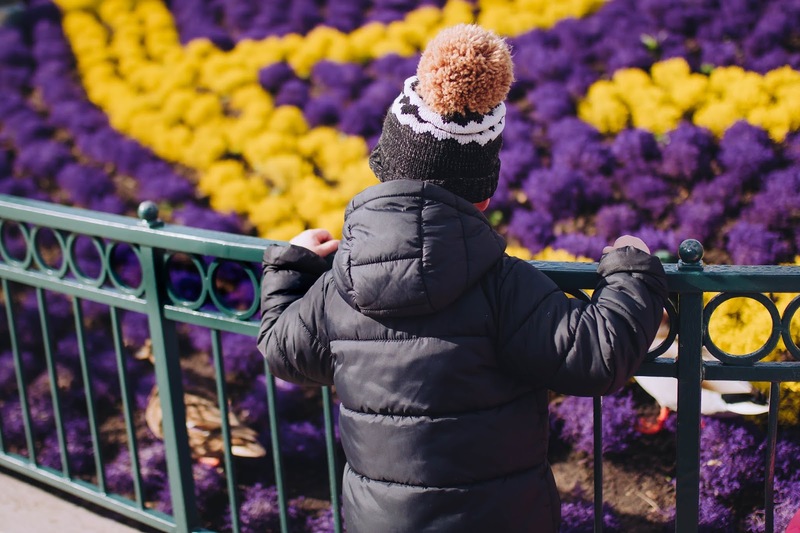 A subtle one but during different seasons these planters have different coloured plants, different statues and Lucas was looking at some Ducks in the picture below but I just think it makes such a nice colourful photo! This one would be great for little children or even bigger children and adults if you sit on the curb by this and do a down low shot again! I haven't even managed to explore Adventure land, Discovery land or Frontier land enough yet to find the best photo spots but you do have nice coloured walls in these areas, you also have Molly Browns boat in Frontier land and numerous cute trees and things in adventure land as well as adventure isle and the pirate ship by pirates beach so if you have a cute outfit or anything to photograph this would work! Also the teacups make a beautiful image (but this was closed) and there is a teacup photo opportunity near curious labyrinth! Where are your favourite spots?